Teaching Essential Principle 2: Climate is regulated by complex interactions among components of the Earth system. Teaching this principle is supported by six key concepts. Earth';s climate is influenced by interactions involving the sun, ocean, atmosphere, clouds, ice, land, and life. Climate varies by region as a result of local differences in these interactions. Covering 70% of Earth';s surface, the ocean exerts a major control on climate by dominating Earth';s energy and water cycles. It has the capacity to absorb large amounts of solar energy. Heat and water vapor are redistributed globally through density-driven ocean currents and atmospheric circulation. Changes in ocean circulation caused by tectonic movements or large influxes of fresh water from melting polar ice can lead to significant and even abrupt changes in climate, both locally and on global scales. The amount of solar energy absorbed or radiated by Earth is modulated by the atmosphere and depends on its composition. Greenhouse gases – such as water vapor, carbon dioxide, and methane – occur naturally in small amounts and absorb and release heat energy more efficiently than abundant atmospheric gases like nitrogen and oxygen. Small increases in carbon dioxide concentration have a large effect on the climate system. The abundance of greenhouse gases in the atmosphere is controlled by biogeochemical cycles that continually move these components between their ocean, land, life, and atmosphere reservoirs. The abundance of carbon in the atmosphere is reduced through seafloor accumulation of marine sediments and accumulation of plant biomass and is increased through deforestation and the burning of fossil fuels as well as through other processes. Airborne particulates, called "aerosols," have a complex effect on Earth';s energy balance: they can cause both cooling, by reflecting incoming sunlight back out to space, and warming, by absorbing and releasing heat energy in the atmosphere. Small solid and liquid particles can be lofted into the atmosphere through a variety of natural and manmade processes, including volcanic eruptions, sea spray, forest fires, and emissions generated through human activities. The interconnectedness of Earth';s systems means that a significant change in any one component of the climate system can influence the equilibrium of the entire Earth system. Positive feedback loops can amplify these effects and trigger abrupt changes in the climate system. These complex interactions may result in climate change that is more rapid and on a larger scale than projected by current climate models. Oceanic, atmospheric, biologic and geologic processes all drive the climate system and result in a distinct regional variability of climates on Earth. Many climatic processes such as the greenhouse effect and the carbon cycle are the result of interplay between the "spheres" of the Earth system (atmosphere, cryosphere, geosphere, biosphere). Feedbacks between various components work to exacerbate or mitigate changes to the climate. Each of these swirling clouds is a result of a meteorological phenomenon known as a Karman vortex. These vortices appeared over Alexander Selkirk Island in the southern Pacific Ocean. Rising precipitously from the surrounding waters, the island';s highest point is nearly a mile (1.6 km) above sea level. As wind-driven clouds encounter this obstacle, they flow around it to form these large, spinning eddies. Image courtesy of USGS National Center for EROS and NASA Landsat Project Science Office. How aerosols play a role in the changing climate. These small airborne particles have both a cooling and warming effect and originate from both natural and human-caused sources. How positive and negative feedbacks in the climate system contribute to the effects of increasing atmospheric CO2. How oceanic processes are integral in the distribution of heat, absorption of CO2 and changes in circulation patterns. Why some past climate changes have been gradual and others abrupt. Compared to air, water takes a longer time to warm up or cool down. A cloudy night will be warmer than a clear night (if all other factors remain equal). The overall climate of a region is not solely determined by its latitude, but is also influenced by factors such as proximity to oceans or mountain ranges. The basics of atmospheric structure and composition, including the concept that air has mass (Earth science). The properties of gases, particularly those gases that can trap infrared heat due to their number of bonds and their ability to absorb and release energy (resonant frequency) (chemistry/physics). Electromagnetic radiation, particularly the difference between incoming short wave and outgoing long wave energy (physics). to oversimplify the greenhouse effect can be counter-productive and further confuse learners. For younger students the mental model of how the natural greenhouse effect is like a "blanket" that keeps heat under the covers may be appropriate, but by high school and certainly college students should have a clearer understanding of the mechanics of the greenhouse effect. This concept is essential to understanding how human activities are impacting the climate system. Most of the energy that reaches Earth';s surface is short wave (UV, visible and infrared), which warms the surface and is transformed into long-wave infrared that radiates back toward space. Most of the gases in the atmosphere (more than 99.9%) do not trap the outgoing long-wave infrared radiation. They can, in effect, be zeroed out of the equation. However, the greenhouse gases in the atmosphere such as water vapor, carbon dioxide, methane and nitrogen oxides are very powerful in absorbing the outgoing infrared radiation and re-radiating it in all directions. Part of the thermal re-radiation returns to Earth causing the lower atmosphere to warm. This process is different from the warming in an actual greenhouse where heat is isolated from convective cooling within the structure. Full comprehension of the carbon cycle requires an understanding of biogeochemical systems. Students also have to understand the different time scales at which carbon exchange takes place in the different reservoirs. Learning about the carbon cycle lays an important foundation to the understanding of the impact of burning fossil fuels. As shown in the famous Harvard Private Universe study, students struggle to build the connection between mass production through photosynthesis and carbon uptake, the burial of biomass and fossil fuels - all these concepts are part of the carbon cycle. The terminology of positive and negative feedback in a system can often lead to misunderstandings. In Earth system sciences feedback loops described changes in a system, positive feedback loops enhance or amplify changes, negative feedbacks tend to dampen or buffer changes. Positive and negative are not used as a value statement as they are in the colloquial use of these words. Just because a process is "complex" does not mean it needs to be complicated. Teaching these basic climate science topics may be best handled by an approach that allows depth over breadth. If students are able to address a single topic with sufficient depth, they can come to an understanding about nuances like feedback loops or deep ocean circulation. So a good tactic would be to set aside time to explore a topic and several facets within it. An important part of climate literacy is an appreciation for scientific complexity, and even young learners can comprehend that a seemingly simple and linear process can be quickly complicated by other factors. Another strategy for teaching these principles is the Earth systems science approach. 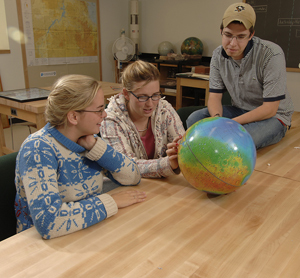 This method teaches students about the "spheres" of the Earth system: the atmosphere, cryosphere, geosphere, and biosphere. An Earth Systems approach is an effective way to illustrate the interplay between different components of Earth and that processes do not occur in isolation. Middle school students can study some of the basic physics of climate including heat transfer of various substances (as in Energy Flows). Applications of this concept include the albedo of different surfaces (see Understanding Albedo), the heat-trapping qualities of certain gases, and how thermal energy carried by ocean currents can influence on local climates around the world. Students can also begin to appreciate micro-climates around the school and in their communities, and start to grasp the world';s geography and global dynamics. In high school, students can learn about the relationship between Earth';s climate and life. The role of the oceans, for example, would make an appropriate medium to study many aspects of the climate system, as is illustrated by the activity Ocean Currents and Sea Surface Temperature. Students can also learn about different aspects of the carbon cycle and understand the nature and the dynamics of the greenhouse effect and heat-trapping properties of different gases. The introductory undergraduate curriculum is an ideal setting to help students gain a firm grasp of what the greenhouse effect is and is not. Furthermore, college students can also learn about feedbacks within the climate system and the role of aerosols. See Tropical Atlantic Aerosols. Simple climate models can be used to introduce students to the complex interactions and feedbacks between different parts of the climate system. Upper-level college students can approach complex climate interactions via their specific field of study. Biology students can examine the carbon cycle or changes in the albedo of land surfaces under various types of plant cover. Students in the geosciences can investigate how the evolution of life on Earth has shaped the climate since the PreCambrian. The complex role of aerosols, which can act to either warm or cool the atmosphere, can provide an interesting and engaging topic for physics students. Example: Exploring the Link between Hurricanes and Climate using GCM Results. Several CLEAN activities that teach Principle 2 fall within the Earth benchmark. For more information see this article about the second principle from Encyclopedia of the Earth. Carbon and Climate - an educational website with a carbon cycle applet for modeling your own projection on carbon emissions and future carbon sinks. McCaffrey & Buhr, 2008: Clarifying Climate Confusion.- journal article in Physical Geography about common misconceptions in climate science.